When you suffer from depression, having a bad day is worse than you can possibly imagine. When I fall into my depression and loved ones ask me how I am doing, my go-to response is always, “I am having a really bad day.” To people who don’t struggle with depression, you may assume this means I woke up on the wrong side of the bed, maybe my car didn’t start, my kids were throwing tantrums or maybe I had a bad experience with a client and so on. I wish it was that simple, that fixable to just restart my day or write a gratitude list and have my bad mood disappear, that would be ideal! But it’s a lot tougher than that. The definition of what I suffer from and have since the age of 18 is a called major depressive disorder. Depression is a mood disorder that causes a persistent feeling of sadness and loss of interest. Also called major depressive disorder or clinical depression, it affects how you feel, think and behave and can lead to a variety of emotional and physical problems. You may have trouble doing normal day-to-day activities, and sometimes you may feel as if life isn’t worth living. More than just a bout of the blues, depression isn’t a weakness and you can’t simply “snap out” of it. I give up on me. I have to isolate to survive my day. A day under covers when the sun is shining. More guilt. What can I put off, I can’t do it. I can’t do anything. Don’t tell me to be grateful that makes me feel worse. Don’t tell me I will be ok bc it always comes back here to this exact dark existence. The same place for the last 20 years, always just as scary as the first time it happened. How can I be saved from myself. My head. My doom. It’s all very gloomy and depressing. Why is this my path? Why can I be stolen from by myself. I am MY OWN JOY THEIF. Being social is too scary today. Too scary to put myself in public. Don’t ask me what’s wrong like I have some sort of reason. I don’t. I’m just miserable. My brain is just deciding to be my biggest enemy today. This hurts my heart, my chest, my soul. It’s all crashing down today. That was my journal entry yesterday. 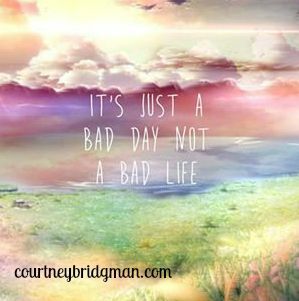 But the good news is, I was able to look at the quote above, “It’s a bad day, not a bad life” and it gave me a sliver of hope. For me hope is huge. Hope gets me through the struggle. The other thing that helped me is reaching out to one of my friends who suffers from depression as well. I was able to tell her I was hurting and really low. Then, she shared with me that she was feeling low as well and it reminded me that PAIN SHARED IS PAIN LESSENED. It was magic. It passed. I have created many mantras to get me through the bad days and this particular one saved me and so did reaching out. I hope when you have one of those days where you feel any of the things I listed, you can reach out and know that you are not alone in this fight that WE DID NOT CHOOSE. Reach out to me and I will always respond because I know that place and even though I may not know you personally, I know that place, I know your pain and that makes us friends.